In the second book of the Stuckey’s Bridge Trilogy, Levi met an alluring young woman named Penelope Juzan. Apparently, the Juzans have quite a past which became the third book in the trilogy. 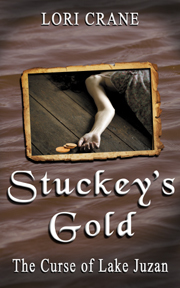 Stuckey’s Gold is the story of four generations trying to escape a curse brought on by greed. The story weaves between Penelope and her friend Luke and their fathers, grandfathers, and great grandfathers. It doesn’t much matter which one we speak of. They all suffered pretty much the same terrible fate. He glanced back toward the shore one more time to make sure Marguerite hadn’t followed him. But what if she had? It wasn’t like he could hide in a rowboat in the middle of the lake. But if she caught him, she would be furious, and he really didn’t want to attract her wrath. She was a mean woman when she was cross. He chuckled. Well, she’d get over it once she ran her fingers through the gold in the trunk. He smiled at the thought. They were going to be very, very rich, and she couldn’t possibly be annoyed with him for that. Suspecting the trunk of gold would be too heavy to lift to the surface by sheer manpower, he had recalled the ideas written in his father’s journal on ways to raise the trunk, and he had brought two extra ropes with him. The plan was to dive down and tie both ropes around the trunk, and then hoist it up into the boat. He hoped he could do so without capsizing the small vessel because it’d be a long swim back to the shore. He tied the ends of the two ropes to the boat and then slapped the water with his paddle to scare off any snakes that might be lurking. He glanced again at the shore, just in case his wife appeared. The coast was clear. He grabbed the loose ends of both ropes and dove into the black depths. It had been so hot the whole summer, the cool water felt refreshing. Down, down, down he went. His ears popped with the pressure. He felt around in the blackness, hoping to find the edge of the net floating in the water. He felt nothing. When his lungs felt as if they would burst, he returned to the surface. He looked around again at the landmarks on shore to make sure he was in the crosshairs of the oak, the pines, the rocks, and the inn. Yes, the trunk had to be right here. He took another deep breath and dove again. About half way down, he felt something brush his thigh. He figured it was one of the ropes, then realized it might be the net. Adrenaline pumped through his veins in anticipation. He grabbed in the direction where he felt the object, but nothing was there. He froze for a moment as an alarming thought came to mind. What if it had been a snake? The snakes around here could kill a man with one bite. It would be a horrific and painful death. He ignored the thought and kept swimming downward, trying not to be too disappointed that he hadn’t found the net yet. When he reached the bottom, his ears pounded from the pressure. He could feel it in his jaw and across his whole head. He quickly groped around in the blackness, knowing he wouldn’t be able to stay down too long. There was nothing but weeds and silt. He kicked off the bottom and shot up again to the surface. He took a deep breath and turned to check the landmarks once again. When he turned to look behind him, he came face to face with the most dreaded of snakes—the cottonmouth. Its snout was not more than a foot from his face, and Gabriel saw its tail flicker in the water nearly three feet away. It was huge, solid black except for tan markings on its face. Gabriel remained as still as possible, hoping the creature was as startled as he and would turn and swim away. The snake quickly slithered across the surface of the water, but it didn’t swim in the opposite direction. It darted directly at him and struck him on the cheek. He cried out as the serpent dashed away, disappearing as fast as lightning. Stuckey’s Gold is available in paperback and Kindle at Amazon and in paperback at Barnes & Noble. This entry was posted in "Stuckey's Gold: The Curse of Lake Juzan", books, indie authors, Kindle, My Books, Saturday Snippet, writing and tagged authors, books, kindle, nook, paperback, snippet. Bookmark the permalink.